When Was Musical Harmony Invented? At the time of the Romans and Greeks, all voices and instruments sang and played a single musical line. They had no idea of creating harmonies. 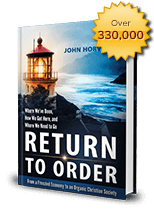 This entry was posted in Featured and tagged America, Christian civilization, Christian principles, economic crisis, Family, frenetic intemperance, honor, Institutions, leadership, organic Christian society, Return to Order by John Horvat II. Bookmark the permalink.